Ch’i-kung is a wholistic system of self-healing exercise and meditation, an ancient, evolving practice that includes healing posture, movement, self-massage, breathing techniques, and meditation. The goal of some ch’i-kung practices is to discharge and eliminate impure or turbid ch’i in a manner analogous to breathing. This leads to a stronger immune system, better health and vitality, and an improved ability to maintain a peaceful state of mind and body when exposed to stress. Ch’i-kung is called a “practice” or “training” because, unlike medication, it is not “prescribed” for a limited period of time, but, rather, practiced daily. This is easy to do because ch’i-kung is as enjoyable as any sport, yet does not require great expenditure of time or money. Students generally practice and average of twenty to forty minutes each day. There is no need for special equipment or a large workout space. Anyone can practice ch’i-kung. There are techniques suitable for every age and physical condition. Ch’i-kung includes standing, seated, and supine methods. With only slight adjustments in technique, it is possible to practice most standing exercises from a seated or lying down position. This makes ch’i-kung an ideal exercise for the disabled. Ch’i-kung practice can be tailored to individual needs making it and ideal aid to recovery from illness and injury. Ch’i-kung is a form of complementary medicine. It works well with other forms of therapy and should never be used as a substitute for necessary treatment by a physician. 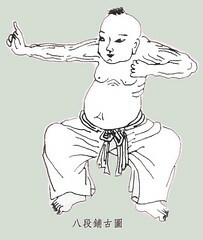 Ch’i-kung techniques are divided into two general categories: dynamic or active ch’i-kung (dong gong) and tranquil or passive ch’i-kung (jing gong). Dynamic ch’i-kung includes obvious movement. The entire body moves from one posture to another, as though performing a dance, or a posture is held while the arms move through various positions. Dong gong is the most popular kind of qigong in both China and the West. It is yang, active, yet it conceals the yin, passive. Externally there is movement, but internally, the mind is quiet, peaceful, and at rest. In tranquil ch’i-kung the entire body is still. The ch’i is controlled by mental concentration, visualization, and precise methods of breathing. Jing gong is externally yin, passive, but internally yang, active. The body is still, yet the breath is moving. The mind is alert and actively paying attention to the ch’i. To put it simply, dynamic ch’i-kung is exercise, and tranquil ch’i-kung is meditation. Yet these categories are not rigid. Stillness and action are relative, not absolute, principles. It is important to find a balance of yin and yang, not just in ch’i-kung, but in everyday life. In movement, seek stillness and rest. In rest, be mindful and attentive. There is not one style or school of ch’i-kung, but rather many thousands, all based on common principles of balance, relaxation, healthy breathing, and good posture. Some ch’i-kung styles are named after animals whose movements they imitate: Crane Style, Snake Style, Dragon Style, the Five Animal Frolics, etc. Others carry names of their actual or legendary founders: Li Family Qigong, Eighteen Monk ch’i-kung, Taoist Monk Chen Xi-yi ch’i-kung. Still others sound like schools of philosophy: Undifferentiated (Wuji) ch’i-kung, Primal Limit (Yuanji) ch’i-kung, Intelligence (Zhineng) ch’i-kung. Some qigong style names might simply describe what the qigong exercises do: Iron Body ch’i-kung, Tendon Strengthening ch’i-kung, Reducing Inflammation ch’i-kung, and so on. More well known Ch’i-kung systems are Baduanjin, Yijinjing, Taiji Chih (Ruler), and Wuji Qigong. For more information about each system click on the word of the ch’i-kung system you wish to look at closer.